I thought this was in an interesting article if true, in the NY Post today. 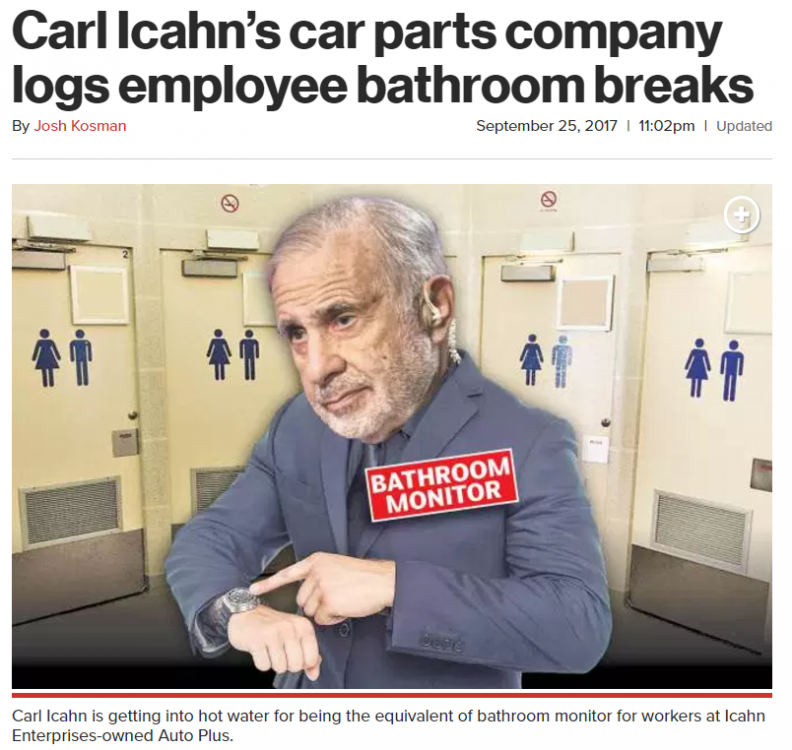 Carl Icahn, activist investor and shareholder rights champion, can add a third title to his résumé: bathroom monitor. Auto Plus, Icahn’s car parts distributor, has started monitoring the bathroom breaks taken by the Kennesaw, Ga., company’s drivers, The Post has learned. The company requires its drivers, who make runs to service stations to deliver car parts, to log out and then back in when they leave for and return from the facilities, said one part-time Massachusetts driver, speaking on background. The drivers, who earn $11 an hour, still get paid for the potty breaks, but the company monitors their runs to the john so they are not abused, according to the worker. The bathroom monitoring was one of several belt-tightening measures Auto Plus implemented this year, the driver said. It also ended holiday pay, dental and eye coverage and disability benefits for its part-time drivers, who represent the largest portion of its workers, he said. Separately, the Harvard Legal Aid Bureau on Sept. 20 filed a demand letter to Auto Plus on behalf of the driver, alleging that he has been accruing sick time at a rate that falls below the state legal minimum since Jan. 1, according to a copy of the letter reviewed by The Post. Icahn bought Auto Plus for $340 million in 2015 and found it to be a poorly run business, a source said.